Skip to the page content. Welcome to the Sand Creek Lounge "The World's Greatest Saloon"
If you're a sports fan, The Sand Creek Lounge is the place for you. Watch your favorite team every season with NFL Sunday Ticket and the Big Ten Network. 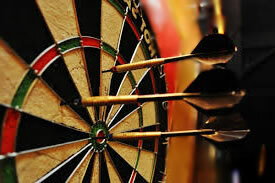 Or try your hand at one of our 6 dart boards and 2 pool tables, with dart and pool tournaments every week! Enjoy our happy hour every day from 7 AM to 6 PM, and extended happy hour pricing for active and retired military, as well as service industry workers. View our Daily Specials page to find today's specials! Join us on Tuesday for free pool all day, and our pool and dart tournaments. Specials for the ladies from 7 PM to close! Every Thursday at 7 PM take a seat at the table and test your Texas Hold'em skills. Open Jukebox 7 PM - 10 PM | Play all your favorites with over 10,000 songs to choose from! $4 Fireball shots and mixed drinks- ALL DAY! Blind Draw Dart tournament at 7 PM - the house matches the pot!! Get a taste of what the Aurora Sentinal has called "...what could be the best steaks in town.". Every Saturday from 6 - 10 PM, we fire up the grill, you just need to decide...Steak, or Ribs? 8 Ball Pool Tournament at 8 PM - the house matches the pot!! There is never a dull moment at The Sand Creek Lounge. Our weekly Dart, Pool, and Poker tournaments are always a great time, and join us during football season for Big Ten Football, and don't miss a minute of NFL action with NFL Sunday Ticket! © 2016 The Sand Creek Lounge. All Rights Reserved.